Looking for a client application that runs on your Windows Mobile PDA that interacts with Virtual Earth? Well it looks like one is now available on Via Virtual Earth’s site gallery. 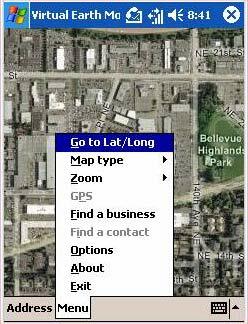 Features include browsing VE road and aerial maps, address and place finding, yellow page searching, GPS support, thumbstick navigation, and integration with Pocket Outlook for finding contacts! Best of all, VEMobile features a cache of previously viewed maps, greatly improving performance and providing an offline experience. Also included is the Visual Studio project files so you can probably hack your own version quite easily. I’ve sworn off Pocket PCs, but I’ll be firing up my old Dell Axim tonight and see how this works.